Founded in early 2012 by Tilsn G., who is still the only member, ILTIZ is dealing with the fascination for soil biology, drug trips and modern human society. Albeit the artist originally is from Germany he's now living in Sweden and continues recording music for his various Projects. I have a great respect for solo metal bands as they do everything themselves. Vocals, instruments and production duties. The buck lands with them if the end product sounds terrible or is just not worth your time. Thanks to artists such as Cloudkicker, Deterior, Judd Madden and Ennoea, the future is looking more brighter for solo metal bands. 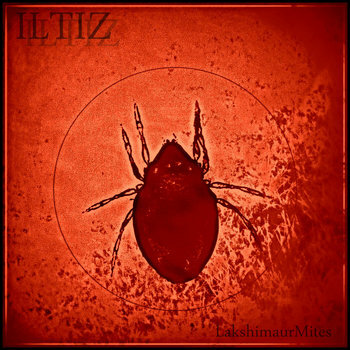 You can include ILTIZ to that list as his debut album - LakshimaurMites – is a one hell of a debut album that ventures from Doom, Sludge, Stoner, Post Metal and Psych Metal. It's a 30 minute thrill ride from one highly talented individual. This album is brilliantly put together that you forget it's actually one person creating all this heavy as hell nightmarish sounds to pulverize your soul to. If you're into Ufomammut, ISIS, Pelican, Sleep and OM then this is the album for you. It's a stunning release that I have listened to non-stop over the last few days. The drone based riffs match against the Sludge, Stoner and Doom sonic riffs with a hint of Oriental mysticism only adds to the albums hypnotic effect. Psych Rock fans should check out the very trippy on the epic 2nd track – Woodlice Never Drivel. Silly title. Sure. And Tilsn maybe poking fun at the Psych Sludge/Stoner Metal genre especially with the funny lyrics. Though you can't deny the great riffs he has created here. LakshimaurMites – is an excellent debut album and I want to hear what ILTIZ has in store for us in the future. LakshimaurMites is available to buy/download on BandCamp Buy Now. My advice – Check it out. You won't be disappointed.